The online assessment system you’ve always wanted. Enjoy complete flexibility with a simple robust system. Your assessment resources are already loaded. Best practice assessment resources at your finger tips. Your logo. Your Branding. Your customised Login. No concerns with offshore servers. Ultimate security. We use aws.amazon.com server located in Sydney. Seamless upload and storage: photos; video; audio files; documents. LOOK!! 6 months data storage – FREE! Take your RTO to the next level. Expand your student audience. Best practice assessments with unsurpassed audit success. Our assessments are validated, tested, audited and current. 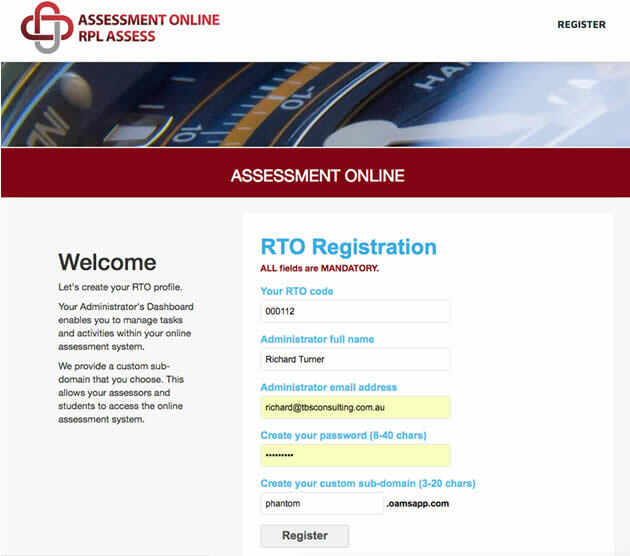 The Assessment Online and RPL Assess system helps RTOs manage the student's assessment process in a most efficient and seamless manner. 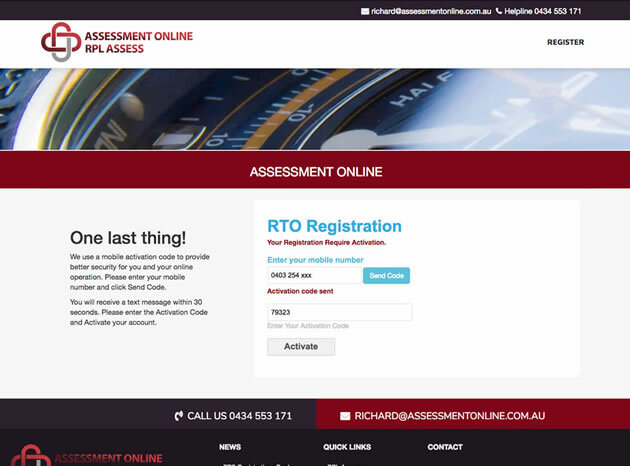 Assessment Online and RPL Assess are available to Registered Training Organisations (RTOs) only. Start by registering and creating your RTO's profile. Nominate a key person within your RTO to become the system's Administrator. The Administrator may then register Assessors, enrol Students, select and purchase the Unit of Competency. You may select an Assessment pathway that includes a robust assessment process mapped against the training package or Recgnition of Prior Learning (RPL), an assessment process that recignises the Student's experience and credentials. Ideally, select a sub-domain that’s easy to remember and user friendly. Save your custom URL in your ‘Favourites’ or ‘Bookmarks’. After clicking Register, follow the prompts and you’ll receive a security activation code on your mobile phone. You can resend the activation code if required. When you Click to log in this login prompt will open. Enter your email address and password to log in. Notes may include; the units or qualifications this person is authorised to assess; the course or client this Assessor will work with; their campus or location; etc. Your Assessor will receive an email with instructions on setting up their password and login. At this stage, your Assessor does not have any students. 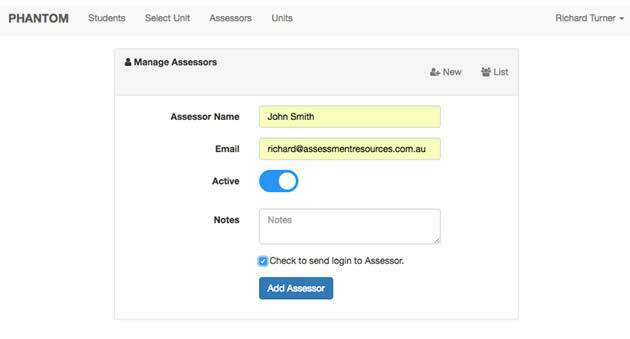 You need to assign Students and Units of Competency under your Assessor. Click on Students at the top menu to see a list of your registered Students. 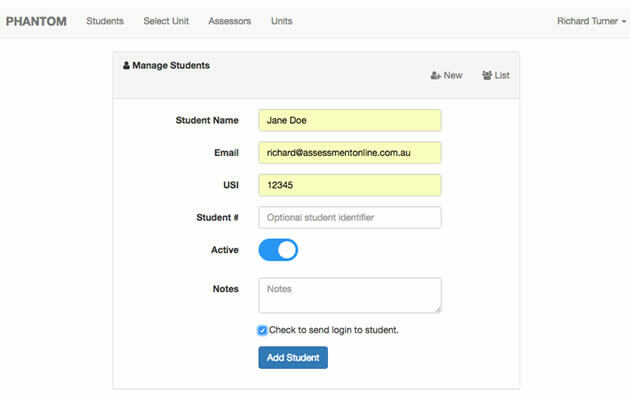 Click on New at the top right of the next menu to register your new Student. Notes may include the course number our course group this student is enrolled in; the qualification this student is enrolled in; etc. Your Student will receive an email with instructions on setting up their password and login. Click on Students on the top left of the main menu. Click on List at top right of the Dashboard. This will open the list of your students. Enter the Assessor you've nominated for this Student. Click on the menu arrows beside Program Type. A drop menu will appear. Use this menu to enter the full unit code and title. 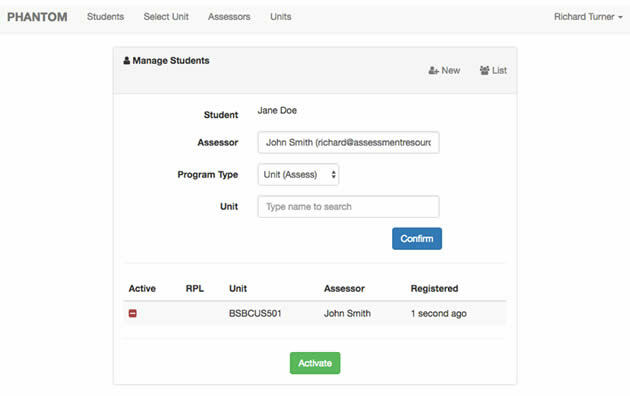 The online assessment system will provide you with the full unit code and title. You may continue to add more than one Unit of Competency to this Student. You will be prompted to Activate the Unit(s) of Competency. A new Dashboard will open and you’ll be prompted to progress to the Checkout. The system will confirm the purchase(s) and the total to be paid before you are committed to make the payment. 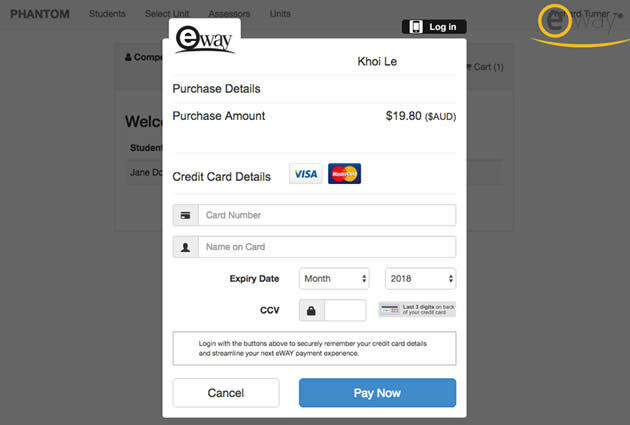 Follow the series of prompts to the secure Checkout and payment, managed by eWay. Click on Processing Complete when prompted and you’ll receive confirmation of your payment. 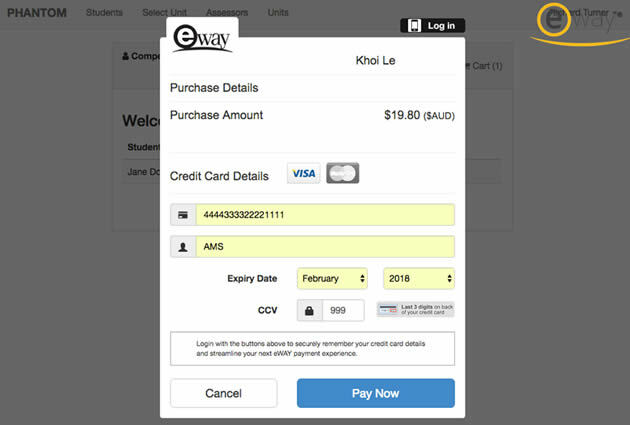 Follow the next series of prompts to the secure Checkout and payment, managed by eWay. You won’t incur any charges. After the payment complete, the system presents you with a list of your Student(s) and their assigned Unit(s) of Competency. You can also change the enrolment details by clicking on the Edit Pen on the left. The status icons show the Student(s) are Active. 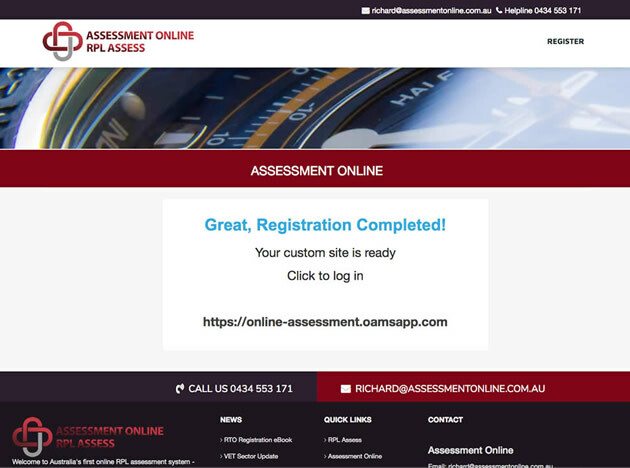 Welcome to Australia’s first Assessment Management System (AMS)©. A brand new concept that makes assessing your students quick and easy. We include valid, reliable and current assessment tools to assess each of the criteria within each unit of competency. Brand your AMS as your own by adding your RTO logo, colour scheme within your customised sub-domain.